me fruits and vegetables. Fruits and vegetables should only be given once in a while as a lot of fruits and vegetables can lead to the hamster having diarrhoea. By nature, hamsters are a hoarding animal, filling their pouch at its maximum and then putting the contents at a corner of the cage. 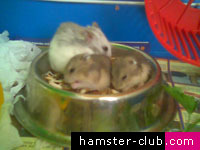 Hamsters like a large selection of pelleted hamster diets which are available at all pet shops. 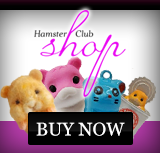 Good food is important as it affects the hamster�s health, life span and reproduction. If you are giving your hamster a good and balanced diet, it is unnecessary to give the hamster vitamins, minerals and salt blocks. 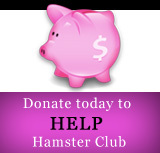 If you wish to offer your hamster a treat once in a while, buy a hamster commercial product that is nutritious and safe. Avoid giving you hamster sharp, dry, stiff or sticky (such as candy) food, as they will get stuck in the hamster�s cheek pouches and injure the delicate tissue of the hamster�s mouth. These foods should be completely avoided and never given to hamsters. Chocolate and �junk food� should also be avoided as it is not nutritious to a hamster�s health.